Choosing an Engagement Ring With or Without Your Partner? It’s the 21st century, so there’s a lot that has changed when it comes to marriage and proposal. For one, although we’re sure many men & women still enjoy the tradition, it’s not unusual for a woman to propose to a man either. However, another thing that has changed is also the nature of how you go about the proposal, especially when it comes to engagement rings. I mean, these days it would be fine to split the cost of the ring, and it’s not unusual to get your partner more involved in the process either. And we’re sure that for many people, you would love to surprise or be surprised by your partner. However, the risks associated are spending buckets full of money on a ring that they don’t actually like, but would feel obligated to wear for the rest of their lives. Now, we’re not trying to instill fear into our readers - only to educate you with the different levels of involvement that could increase the chances of getting a ring that your partner would love, all without losing the romanticism of the proposal itself. So what are the pros and cons of each of these? The pros is that it’s a super romantic gesture that can win you some major brownie points, especially if you get everything right. The cons are that you might choose a ring that he/she doesn’t like, and will awkwardly be stuck wearing the rest of his or her life. You should consider this approach if you’re really confident about your partner’s tastes, and can often buy them something or at the very least spot something that you know they would love if you bought it for them. This is one of the best routes in our opinions. The pros of this is that you can discuss what your partner likes and doesn’t like - which is especially easy if marriage talk has been on the table already. This will give you an idea of what they like, all the while keeping the final product a secret. This makes the process a lot less stressful for you too! The cons is that it won’t be a complete secret, and that if your partner has expensive taste - the ring could potentially be more than you can afford! You should consider this approach if you’re unsure what your partner would like, but you’ve already spoken about marriage. The benefits in this approach is you’re more likely to choose a ring they will love, and she’ll also be surprised as to when you will purchase the ring, what it is, and when and how you’ll pop the question. The pros of this approach is that you’ll almost definitely choose a ring that they will like. The cons are quite obvious, being that there will be virtually no element of surprise, as well as a higher chance of you spending above your budget. This is because your partner will be able to pick & choose, as well as have the sales representative show them the more expensive options - so we would hope your partner doesn’t have expensive taste! Your partner will know the cost of the ring, and you’ll feel a bit more sheepish haggling in store! Consider this option if your partner is really picky or you have no idea what he/she likes, or if they don’t care about being surprised at all, because you both know that the engagement is impending. Yes, there’s one more option. 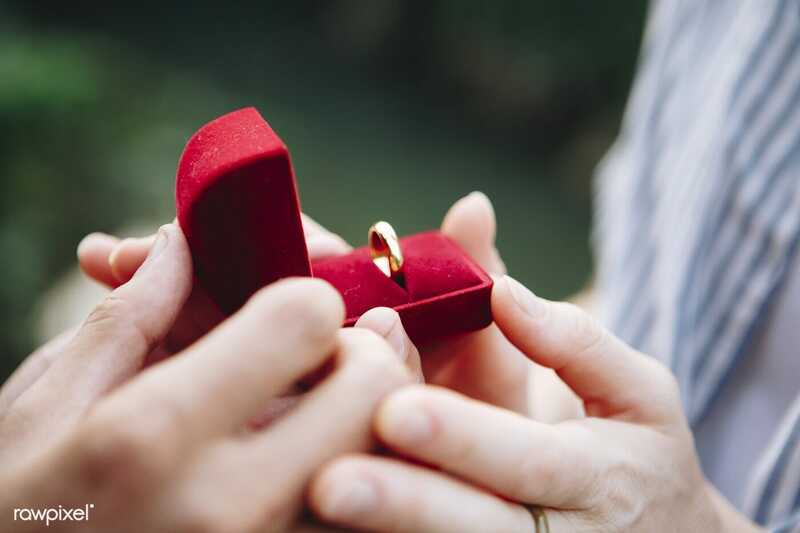 If you’d like to surprise your partner, but still want her to get involved in buying the perfect ring, you can always surprise her with a stone in a ring box. Later you can both shop for the setting - which is arguably the most important part of the ring. This way you get the best of both worlds! The only thing would be having to hold off on taking engagement pictures for your family and friends, given that the ring is only halfway there! At the end of the day, the choice is yours. It’s likely that surprising your girlfriend or boyfriend is a once in a lifetime opportunity to show how thoughtful and romantic you can be - so we say that the element of surprise is quite important, and very special! However, a lot of jewellers nowadays do report that more partners are coming in to shop together, so at the end of the day, the decision really depends on your relationship and whether you and your partner would be happy to do so. Whether you’re looking to shop alone, with your partner, or whether you’re just looking for a loose diamond stone - GoldeNet are here for you. We sell a range of customisable rings, as well as an abundance of loose stones of varying price, cuts and so on. Customise your own ring today, or visit us in our Brighton Showroom.